This is officially my last week in Japan. When I first arrived this seemed like a very foreign place. Now that I have been here for a while and contemplating a return to the good ole US of A, Japan feel like home and the US seems like some alien world full of ghosts and strangers. I hope that is not the case! I really do look forward to getting back to being an artist and disseminating the inspiration I have received here. I feel like a sponge that has soaked up all it can and needs to be wrung out. Well not really wrung out just squeezed gently! I have gained so much from this experience. 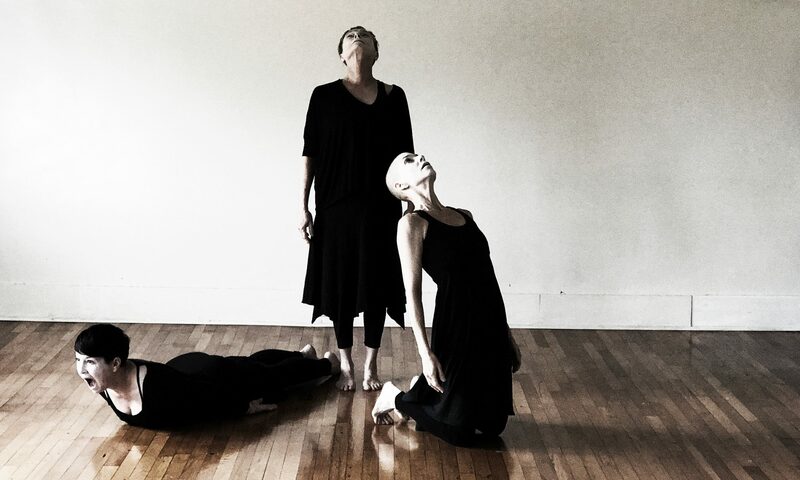 The workshops, classes and performances have been at the core, and through the butoh connection I have met fascinating new friends, been inspired by brilliant teachers, luxuriated in exquisite performance and even had time to enjoy a few amazing sights along the way. I feel I have only touched the surface of the butoh opportunities that are here — I am just now getting into the loop of finding out about performances, classes and workshops. So many teachers, performers and artists struggling to survive and even succeed. Butoh is alive and well in Japan; it just lives underground, on the fringe, along the edges, beneath the suface where you have to dig to find it. I am glad I brought my shovel, but mostly I used my hands and feet. My fingernails are pretty dirty from the effort but I will use that grime as fodder for new growth in my home community and beyond. I visited with Kazuo Ohno again last night. My friend Nathan left a bouquet of lillies on Kazuo’s chest when we left. This beautiful image made me cry. He was so peaceful last evening, not like the last time — Yoshito was with us and seemed to stir him up. Kazuo was singing and dancing — in his way, with the feeding tube in his nose, his beautiful hands drawn up to his chest, his glowing skin vibrating with love and life — what dance is he doing now? Sankai Juku is known for their visually stunning, ritualistic movement style, sensually performed by only men. The workshop was taught by director Semimaru, who was the original member of the company whose work is choreographed by Amagatsu. Members of the company took class with us and performed with us during the final performance at the end of the week. During this workshop I learned a lot about the Noguchi Taiso method of body conditioning which is used by many butoh teachers. This method defines the body as a skin bag filled with water in which float the bones, muscles and organs. Movements involve shaking, waving, floating. Spinal alignment, a central axis, relaxed shoulders, and hanging from a string are basic to Noguchi Taiso. Semimaru also uses the ideas of tension /relaxation, center of gravity, vertical /horizontal, breathing, and rhythm in this work. These exercises felt so good to my body. I plan to continue them to keep me loose and strong. The movement material we performed was not particularly interesting and used the same quality (soft, slow, wavy) throughout. I did not feel a strong connection with Semimaru who is not particularly warm or friendly. I felt he just wanted us to pay our money, not make too much trouble and then go quietly away. I took a 10-day workshop in Kyogen, the 700-year-old comedy form of Noh theatre taught by 8 different Kyogen actors, including Manzo Nomura IX, who is a Living National Treasure. The form blends ancient techniques of Chinese and Japanese theatre. There is no book for teaching Noh and Kyogen. It is handed down by experienced actors and learned through imitation. Children begin learning at 3 or 4 in a 5-minute lesson. Each day 2 minutes are added to the lesson. The first role given to a child is that of a monkey. The role is quite a difficult one because the player must wear a mask which limits breathing and visibility. During one of our sessions we put on the masks and moved around on the stage which proved to be quite challenging. The wearing of masks in Nom and Kyogen symbolizes the embodiment of the gods. 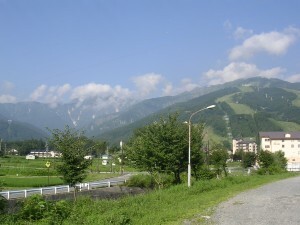 The Dairakudakan workshop took place in Hakuba in northern Honshu where the ’97 Olympic skiing took place. The scenery was stunning as you can see from the photo taken from the front of our hostel. The first 4 days of the workshop were interesting and physically challenging. We worked from 8 til noon, 2 – 5, 7:30 – 9:30. The rest of the time we were cleaning the hostel, cooking or grabbing a desperately needed nap. Morning and afternoon sessions were with company members learning and experimenting with new movement material. 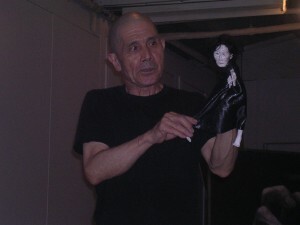 Evening sessions were with Akaji Maru, part movement exploration and part lectures about his philosophy of butoh dance. If Tokyo is the beating heart of Japan then Kyoto is the soul. It is lush green gardens, serene temples and shrines and a much slower paced life style. 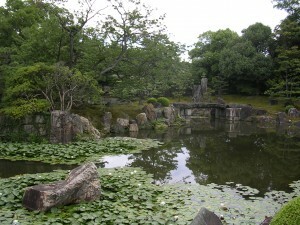 My two favorite places were Ryoangi zen garden and Sanjusangendo temple. Ryoangi is a world heritage site, a sand garden with 15 perfectly placed stones. It reminds me of the ocean with islands rising up from the depths. The groupings of stones suggest varied images unique to each viewer. The wall that surrounds the garden is an object of meditation in itself. The surface of oiled stucco projects ghost-like visions. Just sitting, this lovely garden washing over me, I felt the presence of another time and place — “Ma”. After teaching class, Yoshito, son of butoh founder Kazuo Ohno, often dances with a puppet of Kazuo, to the music of Elvis. It is really a treat! On Saturday night we danced a requiem for Pina Bausch, avant garde German choreographer and dear friend of the Ohnos, who died on Friday June 26. We danced about strength and delicacy to “Amazing Grace” and “Ave Maria.” There were students from Brazil, Thailand, Israel, Japan and the US. It was quite powerful! Kazuo has a generous and warm personality. Because he was in the first ankoku butoh performance when he was 14 he has been present for the entire history of the genre. His classes are filled with quotes and stories about Hijikata and Kazuo. 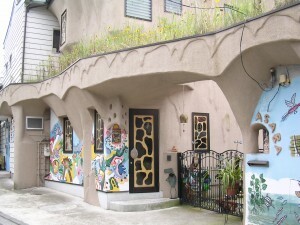 This district was one of the few in Tokyo to escape most of the destruction of the 1923 earthquake and WWII bombing. There are many old wooden houses, shops and temples. In addition, there is a lovely old cemetery and many Japanese style mansions. I had a lovely time getting lost in the warren of narrow streets. 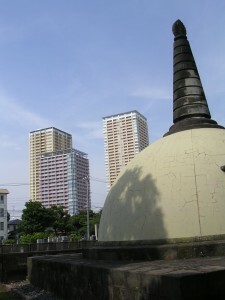 The photo is taken from inside the cemetery with a view of Tokyo skyscrapers in the background. This may not be appropriate but who am I if not inappropriate. position one assumes to use it, squatting down facing the hooded end of a usually porcelain trough. 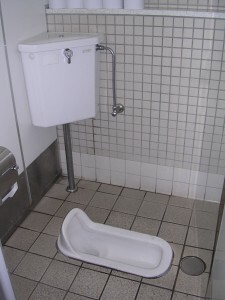 The washiki is considered more hygienic and wastes less water than a Western toilet, but using one can pose several problems–missing the trough altogether, splattering yourself or falling in the trough. At the other extreme is the washlet which looks very much like a standard Western toilet. However the add-ons are positively Star Trek-esque. Washlets come with a heated seat, bidet with buttons for front or back spray, controls for temperature and jet power, as well as a dryer. There is also an “etiquette” button that provides flushing sounds to cover up any straining, groaning or splashing noises you may make. What fun to use the bathroom in Japan!